We are approaching the great penitential season of Lent. If we live the season as we ought, we will invariably think a good deal about sin — how we can avoid it, repent of it, get it forgiven, root it out of our lives, and pay the temporal penalty for it. As the great spiritual masters remind us, mortal sin rarely arises suddenly, with no habitual dispositions favoring it. True, our disordered concupiscence can indeed catch us by surprise and we fall into grave sin without an obvious path to it, but most of the time, the way to mortal sin is paved with lots of venial sins, which make us accustomed to a little bit of this or that bad behavior, weaken our resistance, lead us astray. If one tells a lot of small lies, one is greasing the axle for the big lies. If one eats and drinks a little too much again and again, one is laying a foundation for gluttony. And so on, with all the deadly sins. It’s spiritual common sense. This being so, it seems a sort of enlightened self-love (so to speak) that we should strive to discover how best to avoid venial sins; how best to rid ourselves of them and their bad effects; if habituated to them, how to break the habit. Fortunately, Holy Mother Church in her age-old treasure chest has gathered for us many means by which our venial sins can be remitted and prevented, and our charity enkindled. Some of these means were tossed aside after the Council, when even the basic elements of the doctrine of sin and grace were being called into question. Happily, such practices are still cherished in traditional enclaves, and their frequent and consistent use is one among many reasons to prefer such enclaves. It goes without saying that these practices ought to be taken up everywhere, whether in connection with the traditional Latin Mass or not, but there is no question that their use is easier to revive or continue in the setting of the TLM. [T]here are many remedies against venial sins; for example, beating of the breast, sprinkling with holy water, extreme unction, and every sacramental anointing; a bishop’s blessing, blessed bread, general confession, compassion, the forgiveness of another’s faults, the Eucharist, the Lord’s Prayer, and other sorts of light penance. This is a very interesting list of examples, and prompts a number of thoughts. 1. The beating of the breast (tunsio pectoris) is the first example that comes to St. Thomas’s mind. That’s not to say it’s the most important, but there is something rather obvious about it as a sign of repentance. Thomas is reminding us here that, done with devotion, the beating of the breast actually remits or prevents venial sins. As I noted here, a Catholic attending the TLM will beat his or her breast as many as 15 times during the liturgy. 2. When we read of the "sprinkling with holy water" (aspersio aquae benedictate), the importance of the Asperges comes to mind immediately (or the Vidi aquam in Paschaltide). Why did this ritual ever pass out of use? 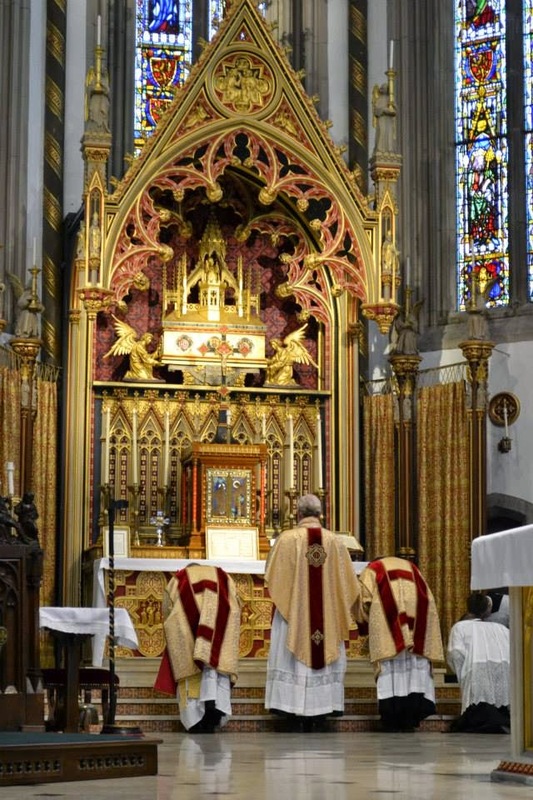 In any case, TLM communities should be aspiring to a Sunday High Mass preceded by the Asperges. It is a beautiful blessing, a reminder of our baptism, and a perfect preparation for the sacrifice of the Mass — a symbolic bath before the banquet, one might say. Everyone washes (or should wash) before partaking of a meal, and our approach to the passover Lamb should be no different spiritually. 3. Extreme unction, sometimes called anointing of the sick, obviously remits venial sins, because it remits repented mortal sins as well, and, to invoke a scholastic axiom, that which can do the greater can do the lesser. The "sacramental anointings" that go along with baptism, confirmation, and holy orders are also efficacious against venial sins. 4. "A bishop's blessing." When a bishop processes down the aisle making the sign of the cross over the gathered faithful, this isn't simply a formal way of saying hello or of establishing episcopal credibility. He is imparting his blessing, which, as Thomas points out, has the same sort of effect as the beating of the breast or the sprinkling with holy water. 5. It's fascinating that St. Thomas mentions "blessed bread," a custom long since lost among Roman Catholics but still preserved among the Eastern Orthodox and the Byzantine Catholics, who share out, after liturgy, bread baked for the liturgy that was not consecrated in the anaphora. For Eastern Christians who may be reading this, the partaking of the antidoron remits your venial sins. 6. By “general confession,” St. Thomas is referring to the saying of the Confiteor or a similar prayer that is recited in common and refers to sins generally. It is noteworthy, again, that at every Mass celebrated in the usus antiquior, the Confiteor will be recited at least twice — once by the priest and once by the servers — if not three times, wherever the laudable custom of the Confiteor immediately before communion is retained. 7. "Compassion, the forgiveness of another's faults." Here we are reminded by St. Thomas that our interior attitude towards our suffering brethren or those guilty of having injured us is itself a potent factor in the remission and prevention of venial sins. 8. "The Lord's Prayer." It should come as no surprise to find Thomas listing this sovereign prayer among the various means given to us to combat venial sin. What bears noting is the manner in which the Divine Office in its pre-1960 form utilized the Lord's Prayer frequently throughout the day, whereas later reforms to the Divine Office tended to minimize its use, presumably in deference to "ancient practice" and with the theory that repetition kills devotion. While the ancient practice may have been as they say, the theory that undergirds the anachronistic attempt to revive it is highly questionable, to say the least. Those who pray the Divine Office in its organically developed form come to appreciate the many times a day it places the Lord's sublime prayer on our lips. To the fourth question it should be said that, as has been said, venial sin is forgiven through the fervor of charity, which explicitly or implicitly contains contrition; and so those things that are in themselves of a nature to excite the fervor of charity are said to remit venial sins. Of this sort are the things that confer grace, like all the sacraments, and things by which impediments to fervor and grace are removed, like holy water, which represses the power of the Enemy, and a bishop’s blessing, or another exercise of humility on our part, like beating the breast, or the Lord’s Prayer, and the like. Our act is required for the remission of venial sin, but these acts are said to remit venial sin as acts that excite our fervor. For more thoughts on all of these topics, see my article "St. Thomas on the Asperges." So, Reverend Fathers, get ready to douse your people this Lent with holy water before the Sunday High Mass! With this simple but potent means, you are driving back Satan's kingdom. Faithful Christian souls, get ready to take advantage of the plethora of tools Holy Mother Church offers you for combating the world, the flesh, and the devil. In IV Sent. d. 16, q. 2, a. 2, qa. 4, sc 1: "Sed contra est quod communiter dicitur, quod multa sunt remedia contra venialia peccata; scilicet tunsio pectoris, aspersio aquae benedictae, unctio extrema, et omnis sacramentalis unctio; benedictio episcopi, panis benedictus, generalis confessio, compassio, alieni delicti dimissio, Eucharistia, oratio dominica, et alia quaecumque levis poenitentia." See "Beat Your Own Breast" for further thoughts on this custom. See Fr. Kocik on how to incorporate the Asperges into the Ordinary Form. In IV Sent. d. 16, q. 2, a. 2, qa. 4, resp. : "Ad quartam quaestionem dicendum, quod, sicut dictum est, veniale peccatum dimittitur per fervorem caritatis, qui explicite vel implicite contritionem contineat; et ideo illa quae nata sunt de se excitare fervorem caritatis, peccata venialia dimittere dicuntur: hujusmodi autem sunt quae gratiam conferunt, sicut omnia sacramenta, et quibus impedimenta fervoris et gratiae auferuntur, sicut aqua benedicta, quae virtutem inimici reprimit, et episcopalis benedictio, vel etiam exercitium humilitatis ex parte nostra; sicut tunsio pectoris, et oratio dominicalis, et hujusmodi." Ibid., ad 1: "Ad primum ergo dicendum, quod actus noster requiritur ad dimissionem venialis; sed ista dicuntur peccatum veniale remittere, inquantum in actum, nostrum fervorem excitant."